They were all there: those who designed it, those who forged it, those who assembled and welded it, and those who closely monitored the requirements and procedures connected with a "safety important" component. 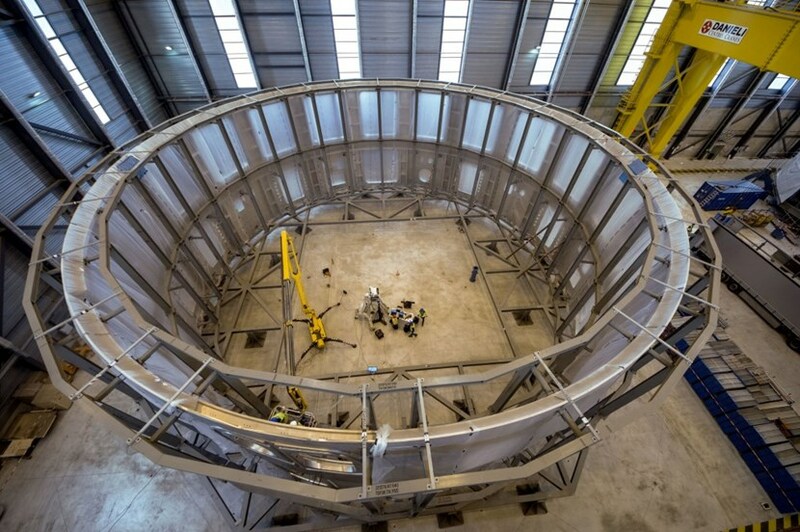 Two years after an array of segments were delivered to ITER, the cryostat lower cylinder—one of the four sections that form the giant thermos that will enclose the machine — had been fully assembled. With scaffolding removed and just a thin translucent film to protect it, the massive structure was at last revealed, both delicate and mighty. 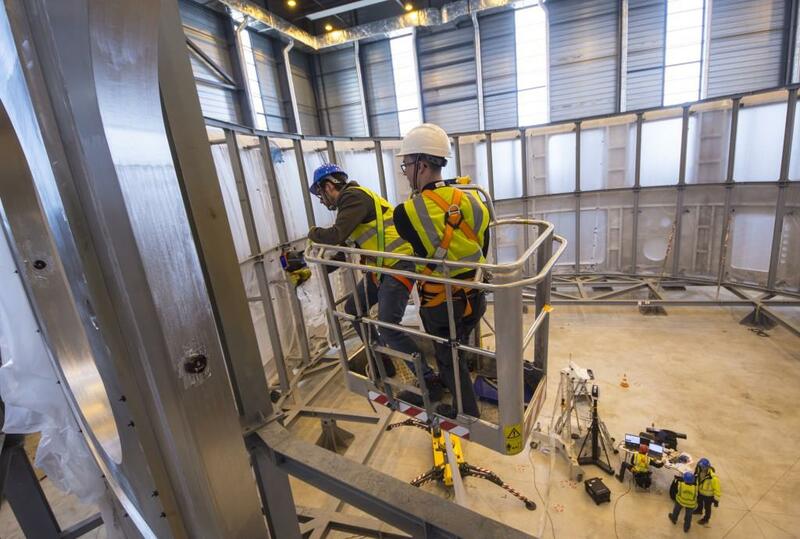 "This is the largest component that will go into the machine assembly pit," said Patrick Petit, ITER In-Cryostat Assembly Section leader. "It is also an example of broad and exemplary collaboration." 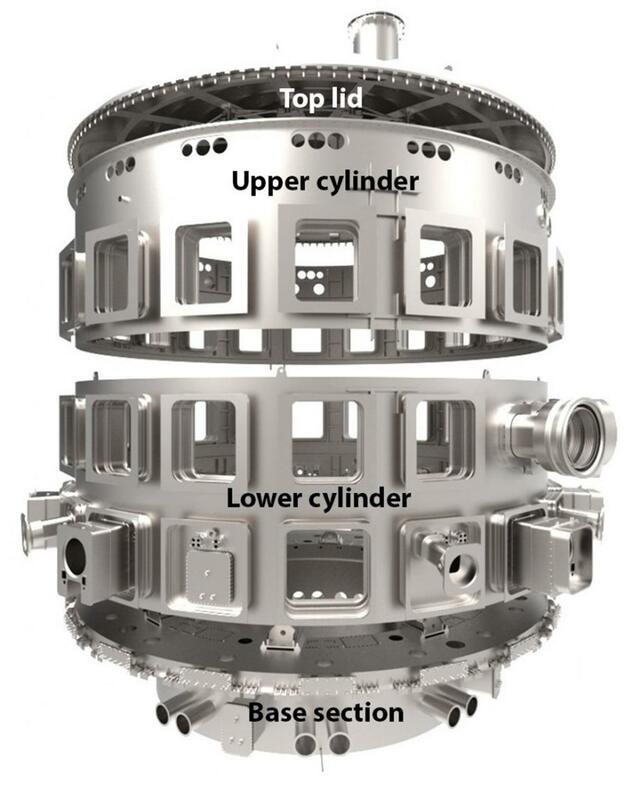 Like the other sections of the cryostat, the realization of the lower cylinder epitomizes the larger collaborative nature of ITER: designed by the ITER Organization, manufactured and pre-assembled by Larsen & Toubro Ltd in India, it was further assembled and welded by a German company under contract to India on international territory conceded by France. "The realization of this component was not a single person's job," said Anil Bhardwaj, ITER Cryostat Group leader. "It has been quite a serious task for all of us, with a large variety of challenges, particularly regarding fitment and welding quality" added Vikas Dube, a mechanical engineer in his team, "and although there were lots of lessons learned, we will face them again when we commence the assembly and welding of the upper cylinder in the coming months." Read more about the fabrication of the ITER cryostat here. "Not a single person's job"
Representatives of the ITER Organization, which designed the cryostat and will integrate it into the machine; of the Indian Domestic Agency responsible for its procurement; of Larsen & Toubro which forged the segments; of the German company MAN Energy Solutions which performed assembly and welding... All were gathered at the Cryostat Workshop on 14 March to celebrate the completion of "the largest component that will go into the machine assembly pit." The cryostat is also a "safety-important" component, with a role to play in the safety of the ITER machine; for this reason, certain requirements had to be respected in its fabrication and assembly. Encased in its transport frame, with scaffolding removed and only a thin translucent film to protect it, the massive structure was at last revealed, both delicate and mighty. The 490-tonne lower cylinder will soon be enveloped in a protective cocoon that will insulate it from external aggressions such as dust and humidity. In the meantime, metrology specialists using 3D laser-scanning techniques are busy mapping selected features where the component will interface with other systems (here, a port for the neutral beam injection system). Based on the precise topography of the "as built" component, the interfaces can be reverse-engineered to fit as precisely as possible. At the other end of the workshop, a big blue device is at work machining interfaces on the pedestal ring that forms the top of the cryostat base. 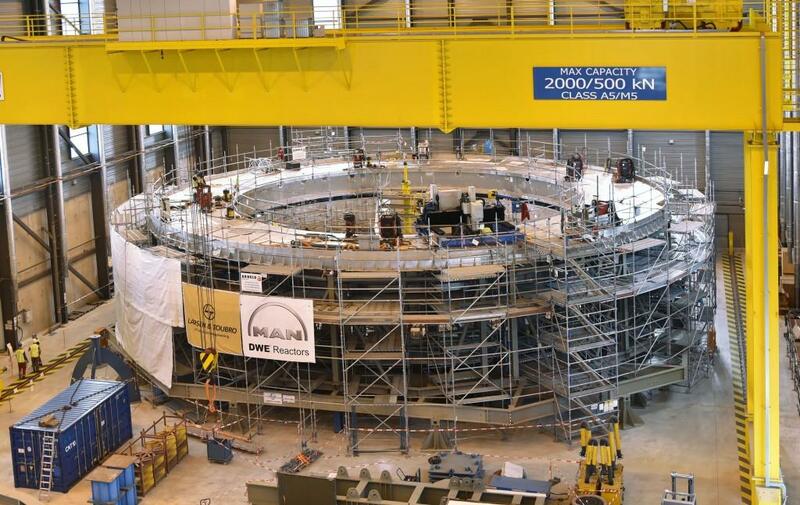 Below the pedestal, the six vertical shells are now welded to the lower sandwich structure, waiting to be lifted and welded to the pedestal ring. 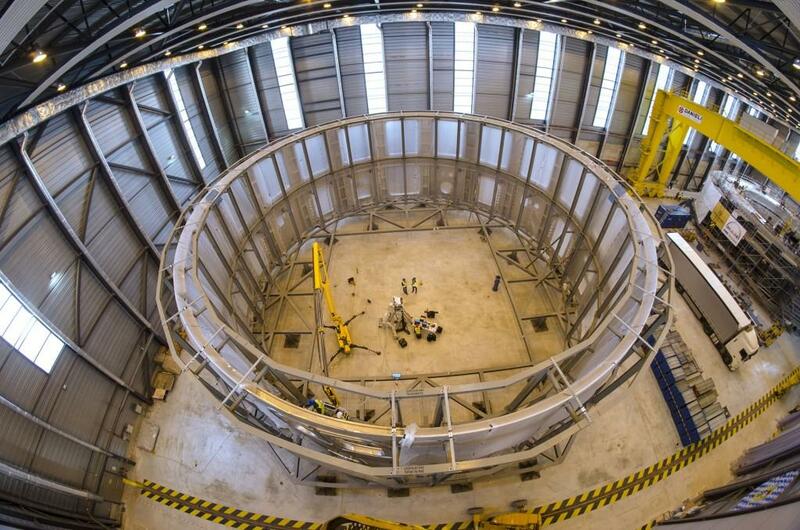 The base section should be finalized in July but, contrary to the lower cylinder, the 1,250-tonne base will remain inside the building to be equipped, under the ITER Organization's responsibility, with different ancillary elements (stoppers for the gravity supports, shims, bellows, etc.). The cryostat is a giant thermos that insulates the magnets at cryogenic temperature from the outside environment. It is made of four sections assembled in the Cryostat Workshop from segments forged in India. 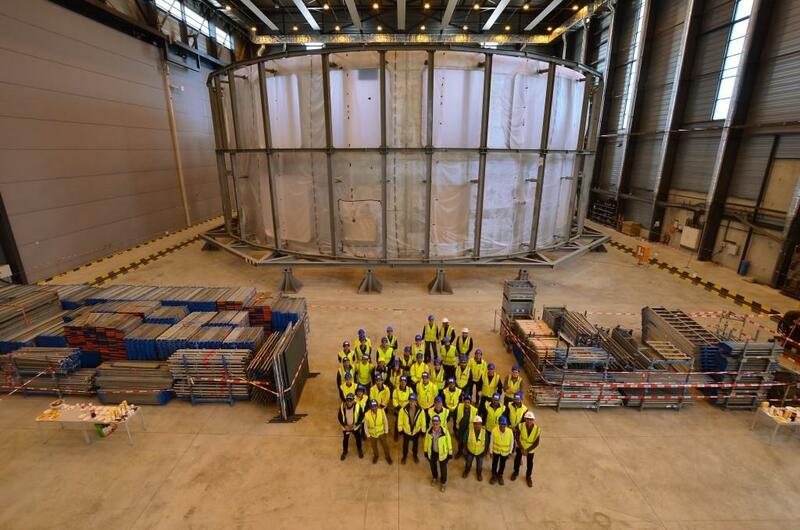 ITER's cryostat will be the largest vacuum vessel ever built.